British Petroleum reported second quarter results with earnings off 53 percent compared to the same period last year. The company still earned $4.39 billion compared to $9.3 billion a year ago, but during the quarter the price of oil had averaged $59.13 a barrel compared to a stunning $121.18 in the second quarter of 2008. Several industry insiders and analysts have stated time and again that based on fundamentals of supply and demand the price of oil should not exceed $60 per barrel and yet in the last 12 months we have seen prices spike to $150, to fall back to about $30 and to rise again to about $70 in the first half of 2009. 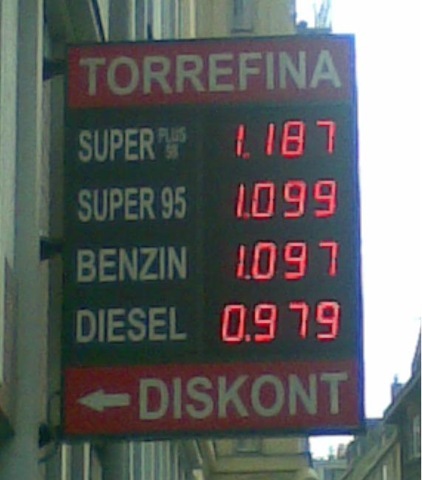 Even the staunchest free market defendants will have a hard time to explain these prices swings. While the oil industry is still coping well with the current situation others are more unfortunate. In a recent CFTC testimony Ben Hirst on behalf of the Air Transport Association of America outlined that airlines consumed 5 percent fewer fuel in 2008 yet their fuel costs went up by $16 billion. According to Hirst who is also senior vice president of Delta Airlines fuel expenses consumed 40 percent of Delta’s total revenue in 2008, forcing the company to lay off about 10000 employees. A price swing of $1 had an annual impact of $100 million to Delta’s bottom line. This reminiscent of beg-thy-neighbor policy where some are profiting handsomely at the expense of others has now become the subject of a series of hearings by the Commodity Futures Trading Commission (CFTC). The hearings are scheduled to be held between 9:00 a.m. EDT and 1:00 p.m. EDT on Tuesday, July 28, Wednesday, July 29, and Wednesday, August 5, 2009. In the spirit of transparency all hearings will be live webcast and testimony and statements as well as supplementary material will be available till August 12, 2009. The subject of the hearings concerns the recent price volatility in energy futures trading and their impact on the spot price for this diverse class of commodities. Chairman of the CFTC Gary Gensler laid out the primary objective to gather information from a wide-range of industry participants and academics in several points. The most important are 1) how to apply aggregate position limits consistently across all markets and participants and 2) how to deal with exemptions from position limits by bona fide hedgers and others. As chair Gensler pointed out in his statement 37 exemptions were granted to NYMEX spot month speculative position limits for crude oil as of July 21, 2009. The average size was 5.639 contracts, almost 2 times the size of the 3000 contracts set as position limit. A survey conducted by the CFTC from July 1, 2008 to June 30, 2009, found that in the nearby NYMEX futures contract for WTI crude oil 2 traders exceeded 10% or more of open interest in all futures and options combined. The largest trader’s position held 14% of OI total. In the first deferred month 5 traders exceeded 10% of OI with a maximum of 18% OI, and in the second deferred month 6 traders held more than 10% with a maximum of 19% OI. This of course does not include bilateral swap trades because CFTC does not have regulatory oversight within the dark pool of OTC markets. For senator Bernard Sanders Rome is burning, using his words to characterize the current situation in the energy markets. As the first one to testify in this most recent hearing he demanded that the CFTC takes urgent action and puts an end to heads, bankers win; tails, everyone else loses. Last year Sanders introduced S.1225, the Energy Markets Manipulation Prevention Act, to address rampant speculation. Last July the House of Representatives overwhelmingly passed similar legislation by a strong bipartisan vote, yet S.1225 did not become law. Congressman Bart Stupak also introduced legislation included in the American Clean Energy and Security Act (ACESA), which recently passed the U.S. House of Representatives and is now pending in the Senate. In his testimony Stupak emphasized the influence index investors have on price developments. From January 2008 till the end of June 2008 index investors were responsible for $55 billion of hot money inflows driving the price of oil from $99 to $140 per barrel. A massive financial crisis caused investors to withdraw $73 billion over the next six months, and the price collapsed to about $30 per barrel. Since the end of 2008 index investors have again increased their holdings of future positions by 30 percent to the equivalent of more than 600 million barrels of crude oil. During his testimony he also addressed the issue of non-commercial traders, namely those banks, hedge funds and large institutional investors who qualify as speculative traders and yet are able to operate under almost unlimited conditions. 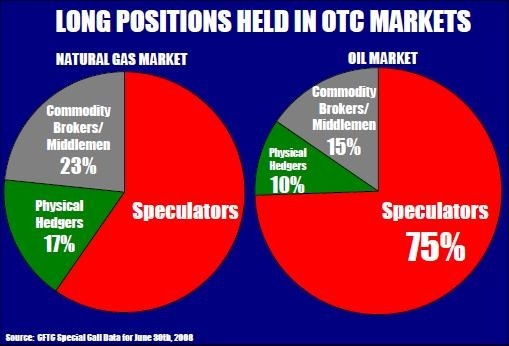 As of June 30, 2008, at the height of the commodities bubble, non-commercial traders held about 60 percent of the open interest in natural gas markets, and 75 percent of the West Texas Intermediate crude oil market. At the same time commercial traders, who actually take delivery of physical oil because they need it to operate their businesses, held only about one third of the long positions in OTC markets. The CFTC is an independent agency of the United States government and operates under the regulatory powers of the Commodity Exchange Act (CEA) enacted June 15, 1936. In 1974, congress amended the Act in an attempt to provide more comprehensive regulatory oversight for the trading of future contracts, and created the Commodity Futures Trading Commission. Since then the commission has fine tuned its regulatory framework but many including Sanders and Stupak urge CFTC to take more decisive steps towards regulation of future markets. For any additional regulation to be successful it will be necessary to close loopholes many energy traders are using today to circumvent existing regulation. Most importantly 1) swap exemptions included in the CEA, 2) Foreign Board of Trade no Action letters, and 3) general swap loopholes which allow swap dealers to circumvent position limits. Hopefully the hearings will help to deal with these very issues, since they are crucial to any successful attempt to reign in rampant specs in energy markets. The Intercontinental Exchange (ICE) is under the supervision of authorities in the UK although it is based in Atlanta, U.S.A. ICE is the largest internet market place to trade futures and OTC energy and commodity contracts in the world and as such detrimental to price developments in energy markets. The exchange cooperates with the CFTC though a no-action letter prevents the commission to impose tough regulation on foreign markets. This loophole has to be closed. Similar to ICE the Dubai Mercantile Exchange (DME) is a fully electronic exchange with its contracts listed on CME Globex and primarily offers energy futures contracts. The DME is regulated by the Dubai Financial Services Authority and can serve as another loophole for trigger happy energy traders. In August 2008 the CME has acquired a 32.5% stake in the DME from NYMEX. In addition about 20% belong to Goldman Sachs, Morgan Stanley, Shell and JP Morgan. In 1991, CFTC authorized the first bona fide hedging exemption to a swap dealer, since then 15 different investment banks have taken advantage of this exemption. Since 2006, NYMEX has granted 117 hedging exemptions for West Texas Intermediate crude contracts, many of which are for swap dealers without physical hedging positions. These exemptions have to end and swap dealers need to come under the umbrella of conventional regulation by the CFTC. Craig Donohue, Chief Executive Officer of CME, admitted that future exchanges took disciplinary actions in 1,334 cases, levying fines and restitutions of $10.3 million, suspending traders for a total of 3,414 days and barring 22 traders from trading at the exchange for at least a year in some cases. According to his testimony he is ready to adopt a hard limit regime to regulate energy future contracts that will include all-months combined limits and tailored hedge exemptions for swap dealers and index funds. But that’s about as far as Donohue goes. During his testimony he defied any involvement of speculation in the recent volatility in energy prices. As much as he condoned this unfortunate development supply and demand remained as the sole culprit. To support his thesis he cited research that used quantitative evaluations rather than qualitative ones from his opponents. In January this year a GAO report did not grant conclusive evidence to some of those qualitative studies which designate speculators as being responsible for the price swings in energy markets. A Wall Street Journal survey of 53 economists agreed and found that market fundamentals were driving prices of food and energy. Donohue confronted the issue of causation by citing evidence that net long exposure of futures-equivalent swap positions declined by 11% in the first half of 2009, refuting the fact that speculators were behind the run up in energy prices during this time period. This somehow neglects the issue of absolute positions in a sense that even less of something can still be a lot, and I do not think it can be used as an effective argument against a casual relationship between speculators and excessive price movements in energy futures and spot prices. The most compelling argument of those who support speculation has historically been to provide liquidity to the market and in doing so helping to find the real price for the underlying commodity. For them the logic followed the more speculation in the markets the better for transparency and price discovery. Granted the mediators in this process were the regulators but markets worked best with the least amount of regulation possible. Senator Saunders begged to differ and saw Rome burning with respect to modern day players in the field of energy speculation. He therefore suggested three swift and unmitigated actions. 1) Immediately classify all bank holding companies and hedge funds engaged in energy futures trading as noncommercial participants and impose strict positions limits on them. 2) Eliminate the conflicts of interest between Wall street’s trading desks and their internal research departments. 3) Revoke all staff no-action letters for foreign boards of trade that have established trading terminals in the United States. Were CFTC to follow these three simple rules excessive volatility in energy prices would almost certainly be a relict of the past. The question is not will it be effective but rather will regulators have what it takes to pierce the zone of influence of powerful financial institutions. Since the necessity to act is so urgent, by no means is it trivial anymore to be complacent and ignore the call for action, there is a good chance we might get tougher regulation this time, even though traders will explore all possible venues to avoid it. Der globale Energieverbrauch wird in diesem Jahr zum ersten mal seit dem Ende des Zweiten Weltkrieges zurückgehen, und zwar um 3.5 Prozent. So berichtet die Financial Times bezugnehmend auf den Energie-watchdog, International Energy Agecy (IEA). Gegnüber 2008 wird in China der Rückgang 2 Prozent betragen, in Russland 10, und in den OECD Ländern fast 5 Prozent. Nur in Indien soll der Verbrauch leicht ansteigen. In 2007 war der Energieverbrauch noch um 4.7 Prozent, in 2008 um 2.5 Prozent angestiegen. Noch letztes Jahr hatte die IEA vorhergesagt dass der Verbrauch in den Jahren 2006 bis 2015 um 32.5 Prozent zulegen wird. Viele Ökonomen sehen darin einen sehr wertvollen zyklischen Frühindikator der die tiefe Rezession bestätigt, in der die Weltwirtschaft heute steckt.